This essay charts the history of the computers produced by Clive Sinclair's companies during the 1980s. It covers the electronic products which preceded his computers and also how and why the business folded within a few years of the first computer being launched. Why Was Sinclair a Success? Clive Marles Sinclair was born on 30th July 1940. After completing his S levels (physics and pure and applied maths), and not seeing the need to go to university, he spent a short stint as editor of Practical Wireless magazine and then editor of Bernards Publishers Ltd. Sinclair formed his first company, Sinclair Radionics, in July 1961. The first Radionics product, an audio amplifier, was launched in 1962, and numerous other low-cost amplifiers and radios were produced during the 1960s. One consistent feature of the Sinclair range was that they were mostly sold as build-it-yourself kits, though also available ready-assembled at a higher price. The Sinclair Micro FM radio, sold as a kit in 1965 for £5.19.6d. 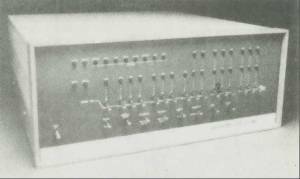 The first Radionics product to make use of digital electronics was the Sinclair Executive pocket calculator of August 1972. The Sinclair Executive pocket calculator. It had an 8-digit display and just the four basic arithmetic functions add, subtract, multiply and divide. Although the Executive was certainly not the first electronic calculator, it was the first genuinely pocket sized one. Previous models had been desktop or at least briefcase sized, because the light-emitting-diode displays and 1970s circuitry took a lot of power, necessitating large battery packs or mains adaptors. Sinclair solved this problem by the trick of rapidly pulsing the power on and off in such a way that power was only 'on' for a few percent of the time. Persistence in the LED display and capacitance in the circuit allowed the calculator to maintain calculation results during the 'off' periods. The outcome was that small hearing aid type cells could provide several hours of use. Costing £80 (at 1972 prices, equivalent to about £500 at 2006 prices) the Executive was hardly an impulse buy but it sold quite well and made a considerable profit for Radionics. It even won a Design Centre award for its styling. The Sinclair Scientific in 1975. This was a strange machine which displayed all results in scientific notation (5 digit mantissa plus 2 digit exponent) and used the Reverse Polish Notation format to enter calculations. For example to calculate 4 x 5 the user entered 4,5,x. 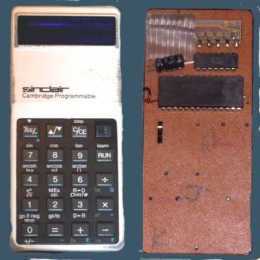 The Sinclair Scientific pocket calculator. The Sinclair Cambridge Scientific. This was similar in appearance to the Scientific above but used normal algebraic entry and had a reasonable range of functions including sin, cos, tan, ln, ex and square roots. It cost £10 in 1977 and was particularly popular in schools because it came with an almost unbreakable outer case. The Sinclair Cambridge Scientific calculator. The Cambridge Programmable. Again using the very compact case of the Scientific, the Programmable had most of the scientific functions of the Cambridge Scientific with the addition of 36 programmable steps. It cost £17 and a large library of programs was available for an extra £5. The drop in price compared to the original Executive, despite extra functionality, was largely due to the reduction in component count allowed by advances in integrated circuit design. The Executive contained about 90 electronic components whereas the Cambridge Programmable (below) had only two ICs and a capacitor. The Cambridge Programmable calculator, front view and circuit board. Notice how each key has several functions, a trend continued in the Sinclair computer range. Another (in)famous Sinclair product was the Black Watch. LED digital watches first appeared in 1972 but they were initially extremely expensive, costing several hundred pounds. In early 1976 Sinclair Radionics began selling a DIY digital watch kit for £17.95, featuring an all-black case and strap, hence the name. At its price the Black Watch should have been competitive but the kit was extremely difficult to construct and fit into the case, and many kits were returned to Sinclair for repair. Battery life was also very poor (the light emitting diode display drew a heavy current from the small battery, even though it only lit up while a button was pressed) and the case was flimsy. Radionics lost a considerable amount of money on the Black Watch and it was withdrawn from sale before the end of the year. The Sinclair Black Watch of 1976. 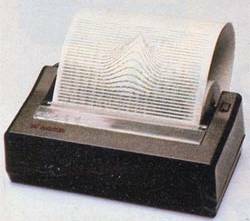 In 1973, when Radionics was making a good profit, Clive Sinclair had set up a skeleton company called Ablesdeal Ltd, later changing its name to Westminster Mail Order, then Sinclair Instruments Ltd and finally Science of Cambridge Ltd. This was to allow him to start trading under a new name quickly if the need arose. From the mid 1970s the price of pocket calculators fell rapidly as electronic components became cheaper and more companies entered the market. The price of a basic four-function model soon fell to about £5 and profit margins virtually disappeared. In 1975 calculators accounted for much of Radionics' sales volume and profits began to slump because of the price cutting; by 1976 Radionics was making a loss despite a respectable turnover. The government-funded National Enterprise Board put in £650,000 to maintain product development, especially of Sinclair's favoured project, the pocket television, in return for a 43% stake in the company. In 1977 the Microvision TV was launched but at £250 sales were slow. Radionics was still making a loss and the NEB increased its stake in the business to 73% in return for a further cash injection of £1.65 million, also appointing their own MD. 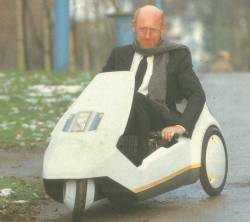 Clive Sinclair was losing control of his business and began to look for new opportunities. At first he split his time between Radionics and Science of Cambridge but in 1979 Clive Sinclair left Radionics completely to concentrate on his new venture. In 1978 Radionics began design work on a computer which eventually became the Newbrain, but Clive Sinclair himself seems to have had little involvement. In 1977 a young electronics engineer called Ian Williamson had designed a simple computer trainer which used many parts from Sinclair calculators, and offered the design for sale to Science of Cambridge. The decision to look further at this potential product was largely taken by Chris Curry, who had begun working for Radionics in 1966 but had now transferred to Science of Cambridge. Williamson's design used a microprocessor from National Semiconductor and when Science of Cambridge approached them about supplying the processor, National Semiconductor offered to redesign the kit to use almost exclusively their own components. This would be a huge advantage in manufacturing since Science of Cambridge would have only a single supplier to deal with, and they accepted the offer. 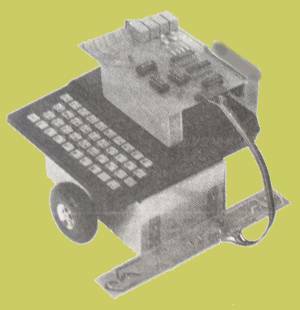 The resulting machine, sold as the Microcomputer Kit 14, was functionally the same as Williamson's prototype but with a different hardware design. It was even supplied with the manual which Williamson had written. The MK 14 was launched in 1978 at £40 and consisted of a very simple microprocessor, an LED display as on a calculator, and a flat calculator-like keyboard, all on one printed circuit board. It could be used to learn the rudiments of microprocessor programming but could not really be called a computer. The Science of Cambridge MK 14 computer trainer used the National Semiconductor SC/MP or 'Scamp' processor. Around 15,000 MK 14s were sold, a large number by the standards of the computer hobbyist market at that time, and its success encouraged Chris Curry to leave Science of Cambridge and be one of the founders of Acorn Computers. Other than one-off 'home brew' designs, the first computer to sell in significant numbers and cheap enough to be seen outside of businesses or research laboratories was the MITS (Micro Instrumentation Telemetry Systems) Altair kit of 1975, but this was very much an enthusiast's machine, programmed by setting the bit patterns of instructions on toggle switches and with an output in binary using a row of lights. The MITS Altair computer. Microsoft's first product was a version of BASIC for the Altair. In the late 1970s a few computers appeared which had proper typewriter style keyboards and a television type display. The most significant were the Commodore PET (claimed to stand for Personal Electronic Transactor) and the Apple ][. These were sold ready-made and the PET was an integrated unit with the electronics, keyboard, display and a cassette tape for storing data all in one neat steel case. 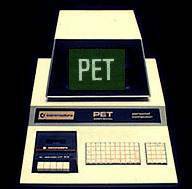 The early model of Commodore PET. The Apple even had a fairly advanced graphical display, as opposed to text only. These were quite capable machines by the standard of the time and were widely adopted by businesses, especially when the first word processors and spreadsheet programs became available. However they had one drawback; they cost close to £1000 which in 1980 put them well beyond the range of most potential home users. A few cheaper designs had appeared (e.g. the Nascom 1) but these were generally only supplied as a circuit board and kit of components, and it was quite an achievement just to get one working, without thinking about actually using it. 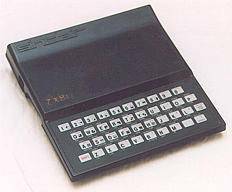 Then in January 1980 Science of Cambridge launched the ZX80. This cost just under the magic £100 mark fully assembled (or £89 if you were prepared to solder the components to the board yourself) and was a complete working computer with a case, a keyboard, a UHF modulator to connect to a domestic television as the display, and an interface to use a domestic cassette recorder for program storage. This meant you could have a working computer for a fraction of the cost of a Commodore PET. Obviously to get the price down to this level there had been some severe cost cutting. The case was two pieces of thin moulded plastic held together with plastic rivets. The keyboard was a thin flat sheet of flexible plastic with printed keys and a conductive coating on the back, which connected with pads on the printed circuit board underneath when the keys were lightly pressed (they did not move). The display was generated by the main microprocessor, rather than a separate circuit, so it was not possible to run a program and produce a display at the same time; the display flickered every time a key was pressed and blanked out completely while a program was running, reappearing when the program stopped or paused for user input. The memory supplied with the ZX80 was only 1 kilobyte of RAM, which was not enough to do much more than run simple demonstration programs. Extra RAM was available but it was costly at around £50 for 3 kilobytes. (This was not Sinclair's fault, RAM was expensive at the time.) Finally the ZX80 had only a 4 kilobyte ROM to store its BASIC programming language and rudimentary operating system. This meant the BASIC was very limited with only integer arithmetic, single dimensional arrays, a bare minimum of string manipulation commands and no control constructs other than GOTOs/GOSUBs and FOR-NEXT loops. So was the ZX80 a real computer? Well, the lack of floating point arithmetic ruled it out for most mathematical tasks, which was one of the main uses of desktop computers at this time. No mass storage (i.e. disk drives) were available and in any case would have cost much more than the ZX80 itself, so data storage and processing was limited to what could be slowly loaded in from tape. The membrane keyboard precluded touch typing so word processing was out, even when a 16 kilobyte RAM add-on became available at £50. (And it did not help that the 'Space Bar' also acted as a 'Break' key when programs were running...) The problem was that the capabilities of the ZX80 had been determined by the need to keep the selling price down, rather than by what constituted a useful computer. The market where price really did matter was with the electronics/technology enthusiasts who wanted to find out for themselves about these wondrous 'computers' which regularly appeared in science fiction films and television in a totally unrealistic form. (Think of HAL in 2001.) These people were not particularly interested in doing anything useful with a computer, it was enough to just have something that looked like a computer and would carry out a program like a computer. In this respect the ZX80 was a success. Putting up with a flickery display and a flat keyboard added to the feeling of being at the cutting edge of technology (even though it was actually a bit outdated). The ZX80 even looked futuristic in its bright white case with black stripes. A well used ZX80. Note the cracks in the casing at the front of the keyboard. The plastic was rather brittle. The blue and yellow colour scheme of the keys was more inviting than the plain greys of 'professional' keyboards. The system of having most of the BASIC command words printed on the keys meant it was just asking you to try them all out. Yes, most other BASICs had more commands, but you had to look them up in a manual first. The single key entry of commands, where for example the whole command 'PRINT' appeared just by pressing the 'O' key, also prevented many typing errors so there was more chance that when you typed in your lovingly crafted program to print out your name 100 times, it would actually work. Uniquely, I think, the ZX80 checked the syntax of program lines as they were typed in and would not accept any which did not obey the 'grammar' of BASIC. This was an advanced feature for a cheap machine and again made writing programs easier. The single key entry of BASIC also reduced the amount of memory needed to hold programs so that more could be fitted into the 1K of RAM, since a word such as PRINT , including the space after it, occupied just one byte of memory, compared to six bytes in most other designs. Keyboard of the IBM 5100. The manual supplied with the ZX80 did a fair job of teaching the general principles of writing programs so that users could feel that computers were no longer mysterious, possibly self-aware, entities but just machines which would carry out a list of simple instructions, whether the instructions were meaningful or not. As a useful, real-world computer the ZX80 was a non-starter, but as a beginner's introduction to the idea of computing it served its purpose well. The circuit board of a home-assembled ZX80. Notice that the keyboard is just an extension of the PCB. The heatsink for the voltage regulator in the upper left hand corner was only a small bent strip of aluminium. It became very hot in use and some users found the computer would crash due to overheating unless the lid were left off! The success of the ZX80 seems to have surprised Clive Sinclair and in total around 75,000 units were sold. 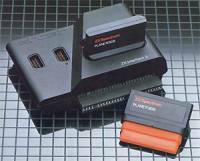 This persuaded Sinclair that it was worth pursuing the computer market and thus in March 1981, about a year after the ZX80 was launched, Clive Sinclair's company (after briefly changing its name to Sinclair Computers Ltd and by now called Sinclair Research Ltd) announced its new computer, the ZX81. This was derived from the ZX80 but with several improvements. The biggest advantage to Sinclair was that it used a single 'uncommitted logic array' integrated circuit to replace eighteen separate chips in the ZX80, reducing the chip count to just four (ULA, ROM, RAM and Z80A microprocessor). This allowed the price to be dropped to £80 for the ready-assembled version. A fudge with the display was devised so that programs could run whilst the unused top and bottom borders of the screen were being scanned and the display was only generated while the main part of the screen was being scanned. This allowed a continuous screen display even while programs were running, with none of the blanking out and flickering of the ZX80, although programs only ran at one quarter of the maximum speed. Alternatively it could operate at full speed but with a blanked display. The case of the new ZX81 was in the then fashionable black plastic and it retained its predecessor's flat membrane keyboard of just 40 keys, but this time with white keys and black and red print. Again it had the keywords printed on or above the keys but the extra commands in the 8K BASIC meant some keys now had up to five labels and an extra 'function' mode had to be introduced. The ZX81's case was more robust and neater than that of the ZX80 but I found the keyboard cluttered in appearance compared to its predecessor, and the print was more difficult to read. 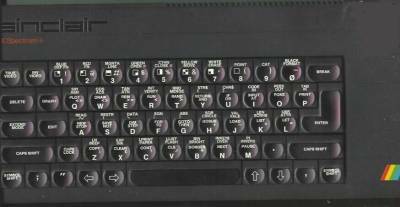 The ZX81 was very plain in appearance, which counted against it when it went on retail sale. For owners of the ZX80 who did not want to buy a complete new computer the 8K ROM chip, new keyboard overlay and ZX81 manual were available as a kit to fit to a ZX80, adding all the features of the ZX81 except continuous screen display for £20. The manual for the ZX81, written by Steven Vickers of Nine Tiles, who also wrote most of the ROM routines themselves, was one of its best features. It is the clearest beginner's introduction to programming in BASIC I have seen and does an excellent job of explaining all the commands without confusing jargon or strange notations. It even manages to introduce some complicated concepts like system variables (the computer's own working space) and the binary format in which numbers are stored. In fact later, when the price of the ZX81 had dropped to £50, it was not unknown for owners of more expensive computers to buy a ZX81 just to learn programming. The importance of a good manual should not be underestimated. For most purchasers the ZX81 would be their first experience of computing and the manual allowed them to quickly get something out of it and feel in control of the beast. For too many other early computers the manual seemed like a hurried afterthought and a new owner could find himself sitting in front of the keyboard looking at a flashing cursor and wondering what to do next. Manuals often fell into the trap of simply listing the available commands, without explaining how or why you would use them. A nice touch was that the manuals for all the Sinclair computers were spiral-bound so they stayed open on the desk. One factor which undoubtedly contributed to the success of all the 'ZX' range of computers was that Sinclair Research were very good at promoting them. They took out double page spreads in magazines extolling the capabilities of the machines and were featured in the science slot on television news. The advertising text was perhaps written with more enthusiasm than strict accuracy but it all ensured that the Sinclair brand featured in the public imagination. Late in 1981 the ZX81 went on sale in WH Smiths, so for maybe the first time in the UK computers became a consumer item. Of course the ZX81 had its critics. Although the BASIC programming language was much improved compared to the ZX80 it still lacked any 'structured' features such as named procedures or library routines. This made it difficult to break large programs down into smaller, more manageable pieces. Such a 'modular' approach to writing programs was beginning to be seen as vital as computer systems became more complex and academics worried, justifiably, that prior use of a ZX81 type BASIC made it more difficult to teach students good programming practices later on. 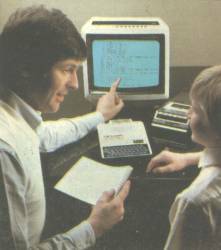 On the other hand, how many boys (almost invariably boys) playing around with a ZX81 were destined to become professional programmers? Sinclair computers were often claimed to be unreliable. Certainly the cases tended to be somewhat flimsy and electronic components were often used to the limit of their tolerances, but the simplicity of the design meant that for the 90% or so of ZX81s which worked properly, they carried on working for years. The ZX81 did suffer from the legendary 'RAM pack wobble'. To expand the built-in and fairly inadequate 1 kilobyte of RAM to a useful 16K meant plugging a tall expansion box onto the exposed edge connector of the printed circuit board, at the back of the computer. This relied purely on the spring contacts of the socket to hold it in place and if it was nudged this was liable to momentarily break the connection, losing all the data stored in memory. RAM packs often ended up held in place with Blu-tack. The keyboard and its single-key entry of commands was the most contentious feature. A real, moving, keyboard was too expensive in 1981 for such a cut-price computer and had the price been increased to around £150 to fund a quality keyboard and case the ZX81 would not have sold in the numbers it did. The keyword system was certainly non-standard but did at least reduce the number of key presses needed on the unresponsive membrane keypad. So was the ZX81 a real computer? With its full implementation of floating point arithmetic and a memory capacity of up to 16 kilobytes (or even 56 kilobytes with some restrictions on how the memory was used) it was now possible to do just about anything with a ZX81 that could be done with a more expensive desktop computer of the time. Clive Sinclair even claimed you could control a nuclear power station from a ZX81! In bringing genuine computing capability to the mass market the ZX81 was undoubtedly the most influential of the Sinclair machines, even though it tends to be overshadowed by the even more successful ZX Spectrum. Although it never found its way into offices or laboratories in significant numbers (somehow it just did not look the part) the ZX81 did become a favourite with experimenters. If you were trying to interface a computer to some other piece of electronics it was easy to apply too high a voltage or short out some terminals. The fact that the ZX81 only contained four readily-obtainable integrated circuits to damage was a definite plus. As late as 1990 the electronics supplier Maplin was selling the 'Trundle' robot, which could follow a black line laid out on the floor and was controlled by a ZX81. The Trundle robot, with attached ZX81, which sold for £55 (not including the ZX81). A question which still awaited an answer when the ZX81 was launched was what exactly home users were going to actually do with it once they had bought it. Unlike a modern desktop PC which can be seen as a multi-purpose domestic appliance for storing reference information, writing letters, helping with photography, playing CDs and DVDs, accessing the internet, and playing very impressive video games, in 1981 there was no obvious use for a home computer. Computer books and magazines tended to talk about using computers to balance your bank account, store cooking recipes and address lists, or for 'computer aided learning'. In reality, who wanted to spend time loading in a program from tape then entering transactions on a flat keyboard, when it was quicker to check your bank statement with an old envelope and a pocket calculator? Normal printed cook books did not need a television display next to them and would stand having gravy spilled over them. Computer aided learning usually meant little more than generating random arithmetic tests. New users would start by typing in the example programs from the manual or listings in computer magazines, but once the novelty of having a computer had worn off would wonder what to do next. One of the biggest differences in home computing between 1981 and 2006 is that at the former date manufacturers of computers assumed that buyers would be writing their own software, since commercial software did not really exist for home computers. As a result all home computers of the early 1980s had the BASIC programming language (or occasionally others) built-in. How many would consider writing their own word processor today? However most new owners discovered that writing large, worthwhile programs is actually rather difficult and as a leisure pastime only appeals to a certain temperament, like doing crosswords or jigsaw puzzles. The kind of programs which tended to be written were mostly games, usually computerised versions of existing games like Pontoon or Othello, or the perennial Lunar Lander simulation. These could be run perfectly well with a text only display. By 1981 video games were common in amusement arcades and simple ones were sold to use with a home television. These second-generation video games were mostly just computers with a joystick instead of a keyboard and running a particular program. Clearly a general-purpose computer like the ZX81 should be able to do the same sort of thing and thus was the computer games market born. Some people discovered they had a knack for programming and could create programs, often games of the Space Invaders ilk, which less gifted owners were willing to pay for. The ZX81's BASIC could carry out around 200 operations (e.g. additions or multiplications) per second, which may sound fast but in fact was way too slow for an action game. By writing the program in the microprocessor's own language, called 'machine code', it was possible to bypass BASIC and make the program run ten or a hundred times faster. The downside was that machine code was much more difficult to program in than BASIC. The net result was that many owners pretty much gave up writing their own programs and bought commercial ones instead. This represented one more shift in the home computer market away from the hobbyist and towards the general consumer. The ZX81 soon became the fastest selling computer in the world and eventually about 1 million were sold. It was due to the popularity of the ZX81 that the UK Press promoted the image of Clive Sinclair as a 'boffin', even though he personally had had little direct input to its design. To a large extent the ZX81 created the home computer market, at least in the UK. It was obvious to Sinclair Research they should stay in this business but the ZX81 with its low resolution black and white display was looking primitive against the full colour displays of the new Atari, Commodore, Acorn etc. computers which were coming to market. One of the new features in the ZX81's 8K ROM was instructions to drive the newly developed Sinclair printer. It is worth pausing to remember that in the early 1980s there was not a large market for computer printers. There were basically two types. 'Dot matrix' printers produced their output by hammering little pins, arranged in a grid, through a typewriter ribbon to create a pattern of dots forming the characters. Dot matrix types printed quickly but the print was of poor quality, obviously-computer generated, and only suitable for rough output. 'Daisywheel' printers had preformed type as on a mechanical typewriter but with the arms arranged in a circle (like the petals of a daisy or the spokes of a wheel) and worked by rotating the wheel until the correct letter was lined up with the paper, then pressing it through a typewriter ribbon to print. Daisywheels produced output as good as an electric typewriter but were quite slow, typically 120 words per minute. Both types of printer cost at least hundreds of pounds which made them an expensive luxury for the home enthusiast. A 1981 computer magazine has prices of £395 for an EPSON MX80 dot matrix printer and £1950 for a Qume Sprint5 daisywheel printer. This is totally unlike the situation today where inkjet printers are practically given away free with every pair of ink cartridges. The fledgeling home computer user still wanted a printer however. It was useful to have a permanent record of any programs written since storage on cassette tape was not completely reliable, and anyway having a printer made the set-up feel more professional. Clive Sinclair was always keen to exploit (or create) a new demand, especially if it could be met by a piece of low cost electronics. What the home user wanted then was above all a cheap printer, and this is what the ZX printer delivered. The ZX printer was remarkably simple. In a black plastic case smaller than a 1lb bag of flour it had two small metal styli attached to a conductive rubber belt. A voltage was applied to the belt and it was driven so that each stylus in turn tracked horizontally across the surface of the paper while the paper was slowly advanced. The paper, in a roll about 4 inches wide, was black but with a conductive silvery aluminium coating and was earthed relative to the styli. This caused a current to flow between the stylus and the paper which burnt off the aluminium coating and allowed the black paper underneath to show through. By switching the voltage on and off very rapidly the coating could be selectively burnt off in dots and these dots could make up the pattern of characters or pictures. The Sinclair ZX printer fitted in with the small size and styling of the ZX81. Heath-Robinson though the idea sounds, it actually worked quite well and the printout was perfectly readable. It was not the sort of output one could use for a formal letter but as a permanent record of program listings or calculated results it was adequate. It was also quite fascinating to watch, as the needle points flashed across too quickly to follow and the text scrolled out, accompanied by a furious buzzing sound and the smell of ozone. I do not suppose it would meet current regulations on radio frequency interference, and breathing in the fumes was probably not healthy, but in 1981 it was unequalled at £50. 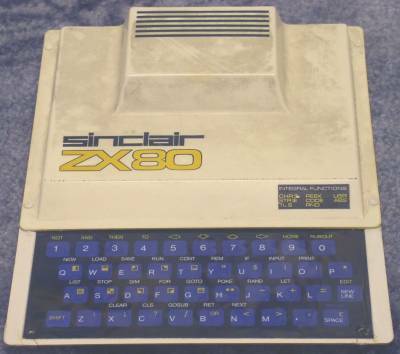 Sinclair needed a computer which would provide an upgrade path for the large number of ZX80 and ZX81 owners but also appeal to the largely untapped general market of non-enthusiasts. Since many potential purchasers would not understand the technical specifications it was important for the appearance of the new computer to be eye-catching. The ZX Spectrum certainly was. In a black plastic case a little under A4 in size the keyboard now took up most of the area, and it had separate, raised keys in place of the old flat membrane. The keys were a pale grey in early versions, later becoming an even more colourful mid blue, and were labelled in white, red, green and other colours. More commands had been added to ZX BASIC and these all appeared on or around the keys. It definitely looked like a device with an impressive array of features. The price had increased to £125 for a version with 16 kilobytes of RAM or £175 with 48 kilobytes - more expensive than the ZX81 but still cheaper than the competition. In mid 1983 the prices of the 16K and 48K memory versions of the Spectrum were dropped to £100 and £130 respectively, bringing colour computers down to the £100 mark. 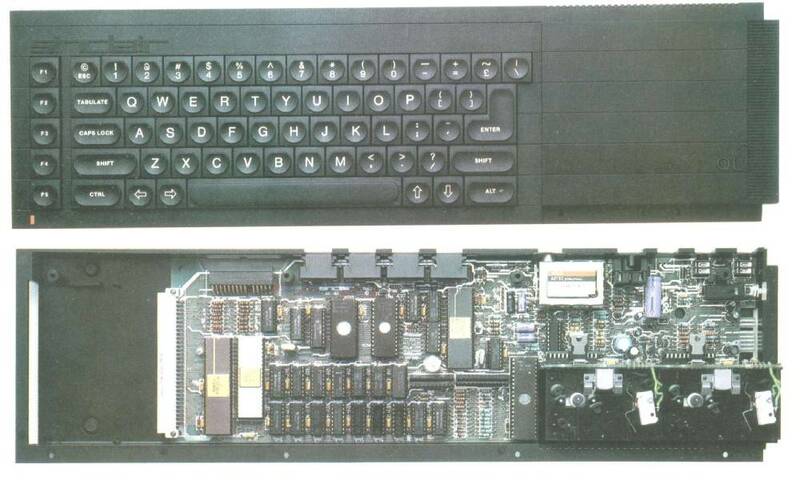 The Spectrum had many improvements over the ZX81. The display hardware had been improved so that the machine now ran at full speed with a continuous display. It could produce eight different colours, at two levels of brightness, and characters could be set to flash. The resolution of the PLOT command had been increased to the quite respectable 256 x 192 pixels and drawing of lines and circles was now supported. The graphics commands available were not particularly advanced, and they were notoriously slow, but they were easy to use from BASIC, unlike many other home computers of the time. There was a BEEP command which produced sound output, and an internal 'speaker'. The new BASIC also allowed saving variables to cassette tape as well as just programs, so that data could be passed from one program to another (previously almost impossible). Looking back, the Spectrum was not really outstanding in any area, but it was competent in most and had no glaring faults. Its strength was that it was just the computer which the home market wanted at that time. With its colour graphics and sound it was now possible to produce arcade type games which stood comparison with anything available on other platforms, and at the starting price of just £125 it was bound to sell well. However the development of the Spectrum had not gone smoothly and Clive Sinclair seems to have been too obsessed with keeping costs down, even though Sinclair Research was already a very profitable company. The operating system/BASIC of the ZX80 and ZX81 had had to be designed to use as little as possible of their 1 kilobyte of RAM. The software writers for the Spectrum (mainly Steven Vickers again) felt that this design would be too limiting for the new machine with its much larger memory and wanted to completely rewrite the BASIC. Clive Sinclair though insisted on reusing as much as possible of the ZX81 system software and just grafting on the new commands for the extra features of the Spectrum. One of the results of this was that the Spectrum's BASIC ran quite slowly. The choice of keyboard was also questionable. The keys were all moulded from one sheet of rubber, like modern TV remote control keypads, and had a nodule underneath, which pressed down onto a membrane keypad as on the ZX81. Whilst there was now some movement in the keys and they were undoubtedly an improvement over the previous flat keypads, the action of the keys was more a case of 'squishing' rather than pressing down and it was not possible to type at any speed. Reasonable quality individual-key keyboards had by this time dropped sufficiently in price that one should have added only about £25 to the price of a Spectrum, and this would have removed reviewers' main criticism of the model. 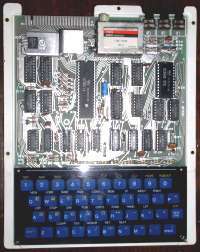 The Spectrum's ROM was was in fact unfinished at the time of its launch early in 1982. Sinclair intended to introduce a range of peripherals, including a network adapter and mass storage device, to accompany the Spectrum. The ROM should have contained the software needed to drive these and indeed the early Spectrum sales brochures stated that it did. In reality the design of the peripherals was behind schedule and there was no working hardware for which to write the software. As a result the Spectrum's ROM has 1170 bytes of unused space, unlike the ZX80's or ZX81's which were packed full. The single-key entry of commands, which had worked well on the ZX80, was becoming unwieldy on the Spectrum. There were over 200 characters, symbols and commands in the Spectrum's character set and with only 40 keys this meant each key had to be able to generate five or six results. Each key could have a letter, command and punctuation mark printed on the key itself, plus two more commands on the fascia above and below the key. There were now two shift keys and to obtain some commands meant pressing both shift keys simultaneously, releasing them, then holding down the right-hand shift while pressing the key with the command under it. It is hard to understand why the Spectrum did not have a few more keys, for instance dedicated cursor keys and common punctuation symbols, other than because the ZX80 and ZX81 had only 40 keys. In fact there was no real need for the system of single key entry of BASIC commands on the Spectrum, with its larger memory. The Spectrum was certainly cleverly designed to achieve a lot with the minimum of components but it had some weaknesses. The sound generator relied on the microprocessor switching a piezo buzzer on and off very rapidly to produce notes. E.g. to produce a note at 1000 Hertz the processor would send a binary 1, then 1/2000th of a second later a binary zero, and repeat 1000 times per second. This occupied the processor full time so that while the Spectrum was generating a sound the program it was running paused. Games programmers managed to achieve the illusion of continuous sound and movement by generating the sound in bursts of a fraction of a second in between updating the display, but the sound had a rough quality. Other home computers of the time usually contained a separate integrated circuit which could produce continuous notes with the minimum of input from the microprocessor. 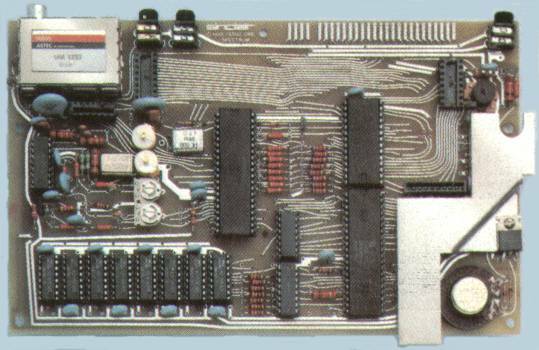 The printed circuit board of the Mark I ZX Spectrum. The graphics display was of a curious design. Whilst it was possible to set or clear any point individually on the 256 x 192 pixel screen, for purposes of setting the colour the pixels were grouped into 8 x 8 blocks. Each block could only contain one 'ink' colour (the set pixels) and one 'paper' colour (the clear pixels), together called the 'attributes'. Setting the colour of one pixel in a block also set all the other pixels to the same colour. The advantage was that the graphics display only needed one bit of storage space per pixel, plus a small extra for the block attributes, and occupied less than 7 kilobytes of RAM in total. To allow each pixel to be set independently to any of 8 colours and two brightness levels would have needed 4 bits per pixel and a total of 25 kilobytes of storage. This would obviously have been impossible on the 16K Spectrum and would have used up over half the RAM of the 48K version. All home computers of the period had the same problem and most solved it by having different graphics resolutions available, with fewer colours allowed at the higher resolutions, to keep the memory usage down. The television display of the Spectrum was not as clear as that of most other home computers, it suffered from 'dot crawl', and it could only display 32 characters per line of text. This limited its use for traditional 'business' type applications such as word processing. One other criticism of the Spectrum, especially from dealers, was the relatively high proportion (said to be 5-10%, or perhaps even more) of brand new machines which were claimed to be faulty and had to be replaced under warranty, though Clive Sinclair always maintained that in many cases it was just that the purchasers did not know how to use them. Manufacture of all Sinclair computers was contracted-out, mostly to Timex in Dundee, and this always makes it more difficult to monitor quality than when production is in-house. It has to be said though that in spite of its shortcomings the Spectrum was actually a very usable computer. Its BASIC gave easy access to the colour graphics and sound, unlike some competitors which required machine code. 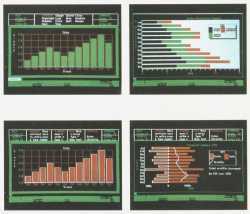 The ability to display text on the graphics screen (which many competitors did not allow) made it easy to label graphs and diagrams, as well as printing the score in games. The fact that the display used a relatively small amount of RAM meant the microprocessor could move objects around on the screen quickly and fast-action games were possible on the Spectrum. The loading and saving of programs on cassette tape was faster than most other computers of the period, and generally reliable. Many of the Spectrum's competitors had design limitations which restricted their use in some way. The Dragon 32 had a good keyboard which would be suitable for word processing, and a built-in printer port, but it could only display uppercase letters. The Commodore VIC 20 had a totally inadequate 5 kilobytes of RAM. The Commodore 64 had better graphics and sound than the Spectrum but a poor version of BASIC and very slow cassette interface. The Acorn BBC model B was excellent in most respects, but was three times the price of a Spectrum. Thus the combination of acceptable all-round capabilities, low price and good marketing ensured that the Spectrum soon became the best-selling home computer in the UK, and probably the second best-selling in the world (after the Commodore 64). 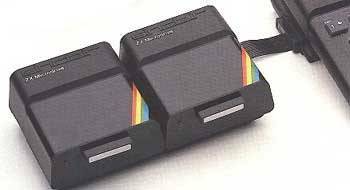 Including later variants over 2 million Spectrums were eventually sold. This also ensured a steady stream of new software for the Spectrum, mostly but not exclusively games, providing another reason to choose the Spectrum over its competitors. A listing in Sinclair User magazine from July 1984 shows over 600 software titles available for the Spectrum, and well over 100 for the ZX81. Nowadays, when PC games are distributed on CD ROM and take up hundreds of megabytes, it is startling to remember how much could be achieved on the Spectrum with just 48 kilobytes of memory available. One of the earliest, and still considered one of the best, games for the Spectrum was The Hobbit. This was a quite sophisticated text-based adventure game but accompanied by about 40 illustrations of locations in the story, which certainly helped to engender a suitable 'atmosphere' for the game. Title screen for the Melbourne House game The Hobbit. The limitation of only having one foreground colour in each character square can be seen in places such as just above the dragon's eyes, where parts of the picture are clearly the wrong colour. The range of software covered learn-to-read education, simulating logic circuits, Z80 assembly language programming, a spreadsheet, databases, wordprocessing, flight simulation, board games like chess and Scrabble, as well as the vast number of 'arcade' type action games. Some of the best Spectrum software was written by Psion, who soon branched out into hardware with their 'Organiser' electronic database. This was followed by the Psion Series 3 and Series 5 pocket computers with large memory capacities and built-in word processors, databases, spreadsheets, et al. (This article was originally typed and edited on a Series 5.) Bizarrely, after becoming the acknowledged market leader in Personal Digital Assistants, Psion then abandoned the business around 2001 to concentrate on networking hardware. The Spectrum was the best designed computer that Sinclair produced, and the most successful, although in some ways it was not as revolutionary as the ZX81 in that it merely took advantage of a market which the ZX81 had created. It was certainly profitable for Sinclair Research. In 1982, the year the Spectrum was launched, around 500,000 home computers were sold in the UK, half of them ZX81s or Spectrums, and Sinclair made a profit of £8.5 million. In 1983 a partial stock market floatation valued the company at £136 million, with only 55 directly employed staff. One of the genuine weaknesses of the Spectrum is that it lacked any ports into which additional hardware could be plugged. It could operate the Sinclair printer but not a standard, business quality, printer, and there was no easy way to connect disk drives for faster and more reliable storage than cassette tape. Surprisingly in a machine mostly used for playing games it did not have a joystick connector and games had to be controlled via the unresponsive keyboard. Perhaps this is because Clive Sinclair always wanted his computers to be seen as 'serious' machines rather than just toys and seems to have regretted their use as games consoles. Certainly Sinclair Research had some ambitious plans for the way computers would evolve. The advertisement for the ZX80 had suggested it could be used as a 'family learning aid' and made no mention of playing games, apart from chess. Sinclair wanted to make inroads into the education market and a government scheme was running at the time which aimed to get classrooms fitted out with computers. (Although quite what the computers were going to be used for was less clear.) The government would reimburse schools half the purchase price of any computers they bought but only if they were one of the approved models, these being the BBC model B made by Acorn, the 380Z or 480Z made by Research Machines Limited, and the Sinclair Spectrum. A local area network was seen by Sinclair as very useful in a classroom since it would allow the teacher, using a 'master' computer, to broadcast programs to all the pupils' machines. This was really quite an advanced idea for 1982 and was ahead of the business computer world. The Spectrum Interface 1 was announced in the promotional brochures at the launch of the Spectrum but in typical Sinclair style did not become available until over a year later. It took the form of an angled black case which fixed underneath the Spectrum, tilting it forwards to a better typing position, and plugging into the Spectrum's edge connector. It provided two network connectors (in and out) and up to 63 Spectrums could be used on one network, by daisychaining leads from one to the next. The new ROM in Interface 1 had commands for transmitting files or programs either to a single specified machine on the network, or to all machines which were ready to receive. Interface 1, which fitted underneath the Spectrum. Also in Interface 1 was an RS232C serial port. This would allow connection to telephone modems which were beginning to be used for wide area networks. It was also advertised as allowing connection of standard printers, but in practice few printers used a serial connection and it might have been better if the interface had added a standard parallel printer port rather than a serial port. Probably few Spectrum owners made use of the networking and serial ports but the other facility included in Interface 1 was more popular. In 1983 computer disk drives were mostly too expensive for home owners, with a floppy disk system costing around £300 and a hard disk about £2000. Sinclair's solution was the Microdrive. A pair of Sinclair Microdrives. The Microdrive had a mechanism similar to that in an audio cassette recorder, with a recording head past which magnetic tape was moved, but capable of recording higher frequencies. The tape cartridges were 3cm square by less than a centimetre thick and held a continuous loop of tape, so that there was no need to stop and rewind. The full length of tape would pass the recording head every 15 seconds so this was the maximum delay between asking for a file and it starting to load. The tape itself was video tape but spliced to just 2mm wide. An internal view of a Microdrive cartridge. 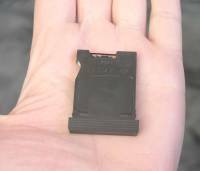 An indication of just how tiny a Microdrive cartridge was. Each cartridge held 85 kilobytes of data, a bit less than a floppy disk but enough for at least two Spectrum programs. Typically files would load in about 20 seconds, much faster than from cassette where load times for programs were usually 4 to 5 minutes, but slightly slower than from floppy disks. The selling point of Microdrives, as with most Sinclair products, was their price. At £50 they were a sensible add-on for a £130 computer, in a way that a £300 disk drive was not. Theoretically up to 8 Microdrives could be connected to one Spectrum for extra storage space, but considering the cost of this most people stuck with just one. The Microdrive proved very popular with Spectrum owners and there were the usual delivery delays at first. The popularity is somewhat surprising since the Microdrive had many drawbacks. The cartridges were initially in short supply, only available from Sinclair, and cost £5 each. This meant commercial software was seldom distributed in this format. The tape was very thin and could easily get tangled. Cartridges wore out quite quickly and had to be replaced. Microdrive storage was never particularly reliable. When Clive Sinclair was asked whether he would be prepared to use a Microdrive to store his own business information (he was actually using an Olivetti PC at the time), after some hesitation he replied yes, but he would keep backups. Despite these failings it seems people were still prepared to pay for the convenience of not having to rewind tapes or wait a few minutes to load a program. When I reconnected my own Spectrum system in the course of writing this article, I was surprised to find that about two thirds of the Microdrive cartridges were still readable, despite being almost twenty years old. Similarly all the programs on cassette tape which I tried could still be loaded, twenty years after being recorded. It seems that magnetic tape is reliable enough if it is not worn out by use. The other peripheral which Sinclair launched for the Spectrum was 'Interface 2' (although it actually appeared before Interface 1). This incorporated two joystick ports and a socket for plug-in ROM cartridges. These were popular on some other makes of computer as an instant and reliable way to load programs, generally games. Interface 2 was an admission that the Spectrum was mostly being used as a games console, but it was not a success. Other independent companies were already selling joystick adaptors for the Spectrum, one by Kempston being especially popular, and had created a de-facto standard for how the joystick movements should be read by the program. Many games were already being written to use the Kempston joystick. Unfortunately Sinclair's Interface 2 used a different mapping between joystick movements and equivalent key presses and thus did not work with the existing software. Also ROM cartridges were expensive, typically retailing around £15, and needed specialist equipment to manufacture them. Games on cassette tape were around the £6 mark and tapes could be duplicated with a simple double cassette deck. (Many software businesses were still little more than one person in a spare room.) Interface 2 did not sell well and was withdrawn within a year. Interface 2 showing joystick ports and two ROM cartridges. 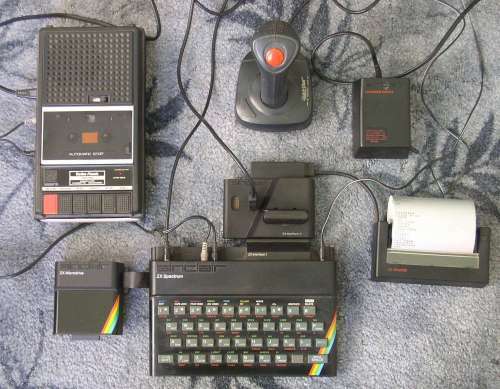 ZX Spectrum system with Interface 1 (mostly hidden underneath), Interface 2, ZX Printer, Microdrive, cassette tape recorder, joystick and ZX power supply. Strangely the Spectrum gained only a few percent of the lucrative education market, with Acorn taking the lion's share with its much more expensive BBC model B. Some teachers thought the Spectrum was too flimsy to stand up to schoolchildren, and with its small size too easy to steal. The lower price of the Spectrum does not seem to have been as attractive in education as it was to home users (schools could have bought three Spectrums for the price of one BBC B). Perhaps this was because (so I believe) the government grants available only covered half the cost of the computer itself and schools had to fund peripherals, consumables, software and training entirely out of their own budgets. The cost of the computer was therefore only a fairly small part of the total expenditure so there was not much advantage in a cheap computer. Schools may as well have paid an extra £135 (£400/2 - £130/2) to have the best machine. Plus of course most schools were state funded and it is always easy to spend someone else's money. Even though the Sinclair Spectrum was hugely popular, it would not keep selling forever. There were signs that the UK home computer market was approaching saturation point by the end of 1983, in that most people who were keen to own a computer now had one. There was also a fall in Sinclair's profits, due to a combination of price cuts to stay competitive (for instance with the Oric 1, offering marginally better facilities than the 16K Spectrum for £100), and the shift of the bulk of sales from mail order to retail, with much lower margins. Home computers were developing very rapidly in the early 1980s and something new was needed, to entice currently untapped market segments and as an upgrade path for Spectrum owners. Several designs were considered. One possibility was an enhanced Spectrum using an improved 'Super BASIC', and work began on the new BASIC in 1983, but was abandoned. A battery powered portable fitted with a Sinclair flat screen display was also mooted, but apparently never progressed very far, even though in an interview in late 1982 Clive Sinclair had claimed such a machine would be launched the next year. 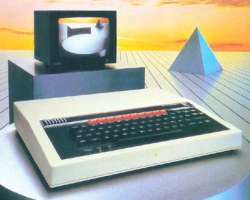 Thus by 1984 the Spectrum, which had not been leading-edge technology when it was launched in 1982, was starting to look dated against its competitors. The main reason it was still selling was the huge catalogue of available software but at some point a replacement would be needed. Had a 'Super Spectrum', with improved BASIC, a proper keyboard, more RAM, maybe a faster processor, but still software compatible with the old Spectrum and priced under £200, been produced around the end of 1983/beginning of 1984 it should have sold well. Eventually an improved Spectrum did appear, the Spectrum 128, but not until 1986. Instead in 1984 Sinclair Research went for a radically different design. What Sinclair actually announced early in 1984 was the 'QL' (standing for 'Quantum Leap'). The QL was certainly a bold move for a company which was accustomed to the cheap end of the home market. It was intended and advertised as a 'professional' and 'business' machine and was an attempt by Sinclair to create a new demand in this market, in the way the Spectrum had with the home and hobbyist markets. It is worth remembering that in 1984 the IBM PC or its clones were not yet dominant in business, at least in the UK, and in fact the early IBM machines were distinctly unimpressive for their exorbitant price of £1000+. They had a text-only monochrome display, colour graphics was an optional extra, and the standard memory capacity was not much more than the best home micros had. The operating system was the command-line based DOS, in some ways less flexible than the combined BASIC/operating system in home computers like the BBC B. There was a definite opportunity for someone to produce an alternative business machine and take the market away from IBM. The price of the QL, £400, was the same as a BBC B for what should have been a far better computer. On paper the QL looked promising. It used a variant of the Motorola MC68000 microprocessor, which was probably the best and fastest microprocessor available at that time and much more capable than the Intel 8086 in the IBM PC. The MC68000 could directly access up to 16 megabytes of memory, whereas the 8086 had a clumsy system of only accessing blocks of 64 kilobytes at a time. The cut-down MC68008 in the QL was restricted to 1 megabyte of RAM but this was still a huge amount compared to the 64 kilobytes or less available to most home computers of that era. 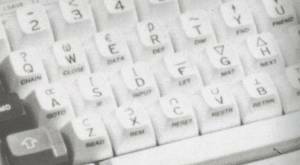 The QL had individual moving plastic keys rather than the rubber mat of the Spectrum, and the keyword entry system had been dropped so that only letters, digits and symbols appeared on the keyboard, giving it a neat look compared to the Spectrum. It had two Microdrives built-in, the networking ports of Interface 1 (which could connect with other QLs or Spectrums), and two serial ports. It came with 128 kilobytes of memory as standard and another 512 kilobytes could be added. The display had only four or eight colours (it was not intended for playing games on) but it had a higher resolution than the Spectrum and the colour of each pixel could be set independently. The BASIC had been expanded to SuperBASIC (similar to that proposed for an enhanced Spectrum), with procedures for writing structured programs and some other clever features. The operating system, QDOS, was in principle capable of multitasking, unlike DOS on an IBM PC. Lastly it was supplied with what would now be called an 'office suite' of software written by Psion, comprising a word processor, database, spreadsheet and business graphics program. The computer press representatives were full of praise for Sinclair's latest creation, even though they had only seen preprogrammed demonstrations. Unfortunately the QL had serious problems. When development began on it at the beginning of 1983 there was no fixed specification for the machine. Its chief hardware designer, David Karlin, had really wanted to produce a top quality powerful workstation, with a price around £1000. Clive Sinclair however insisted on a selling price of no more than £400 to continue the tradition of low-cost Sinclair machines. The basic design kept being modified and features were changed or dropped while it was being developed. One result was that at the time it was announced to the press in January 1984 no working machine existed! By this I do not just mean there were no production models available; not even a complete prototype had been produced. For many reasons the development schedule had slipped but the Sinclair management still insisted on launching. It was several months before machines began shipping to customers and the QL became known as the Queue Hell. The operating system had been intended to fit into 32 kilobytes of ROM and the QL was not to be supplied with BASIC built-in (it was not considered necessary on a business machine). However Sinclair seem to have decided this was too much of a departure from their roots and did add a BASIC after all. The problem was that there was no room for BASIC and operating system in the allocated internal space for ROM and as a result the QL went on sale with an extra ROM chip sticking out of the port at the back intended for software on ROM cartridges. The use of the Microdrives was a bad decision for a business computer, where standardisation and compatibility were already being seen as important. Floppy disk drives were falling in price and one of the new 3½ inch drives would have been more reliable, with more storage capacity than two Microdrives, for a similar cost. The processor was chosen for its value as an advertising point (the recently-launched Apple Lisa and Macintosh machines used a Motorola 68000 and had received very favourable reviews) but Sinclair tried to save money by using the version with only an 8-bit data bus rather than 16-bit. This saved a few pounds on the cost of ancillary chips but meant that the processor had to access memory in two steps rather than one, slowing it down considerably. Even the price of the QL was not as low as it appeared. Whilst the basic machine at £400 was usable, it did not include a monitor display and Sinclair incorporated a UHF modulator so that the QL could be connected to a domestic television. Whilst home users were quite prepared to put up with the wavy text of a TV display with a £130 computer, business users expected something better. A monitor would add at least £200 to the price and then there was a printer and possibly a hard disk drive. The total cost for a QL would then be approaching the same region as the other business machines available in 1984. Also, in 1984 computers in business were seen as something of a status symbol rather than an essential commodity and it is doubtful that a 'budget' machine would create the desired impression. Despite all these negative aspects it is still possible that the Sinclair QL could have been a success, perhaps in higher education where universities were short of cash, not too interested in status symbols, and could appreciate its technical merits. In fact there was talk of Stirling University providing a Sinclair QL to all its students. With its relatively fast processor and high graphics resolution it could have made a respectable games machine in the home market too, but Sinclair seem to have deliberately aimed it away from this use. However to succeed the new computer would have needed to start reaching customers soon after launch. Despite being announced in January with a promise of delivery within 28 days, it was actually around September before most customers (who had paid in advance) began to receive their QLs. "I am not a management type. I am an inventor. I am awful at managing established businesses." The ZX80 was sufficiently simple that it could be designed by just a handful of people. The ZX81 and Spectrum were derived from the ZX80 in well defined ways. The QL on the other hand was totally new, with a processor Sinclair had no experience of interfacing to and hardware that really was a 'quantum leap' beyond that of the Spectrum. For the first time Sinclair also decided to write the system software in-house. To make matters worse two of the chief architects of the ZX Spectrum, Steven Vickers and Richard Altwasser, were no longer on-board, having formed their own (ultimately unsuccessful) company in 1982, producing the Jupiter Ace microcomputer. Such a complex project required clear design goals and careful management to keep it on track and on schedule. Sinclair's management philosophy however was very informal and not good at keeping separate groups working together. There had also been too much of a tendency to allow the design to be modified as it progressed, and a change to one section of the hardware was likely to require changes in other sections, and in the operating system. Perhaps Sinclair had underestimated just how difficult it was to design a truly cutting edge computer. It probably also did not help that Clive Sinclair himself was preoccupied with the disastrous C5 electric car and had even less involvement with the QL than with the previous computers which bore his name. Once the finished version of the QL began to be distributed its owners seemed happy with it, and the office suite from Psion was highly regarded. However it had failed to make inroads in the business market and was not what most home users wanted either. At £400 it was also a little expensive for the traditional Sinclair customers. 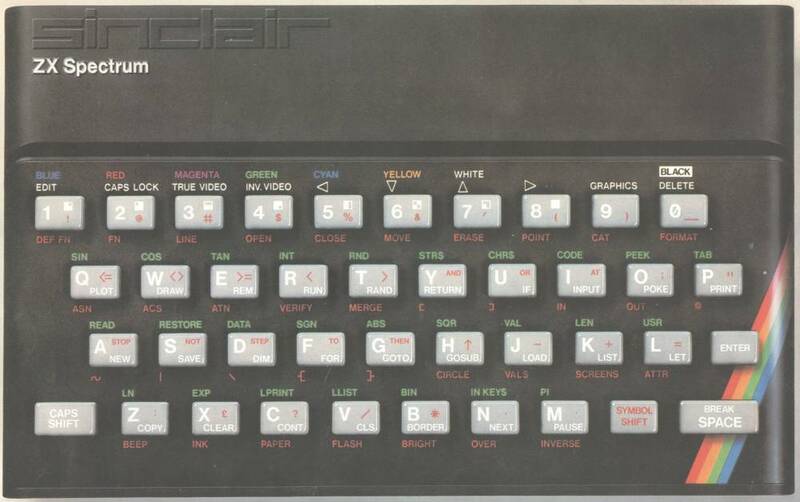 Sinclair now had a problem in that the Spectrum, although it continued to sell well through 1984, was 2½ years old and showing its age, but they did not have a replacement for it. The modest sales of the QL (which eventually reached about 100,000) were not bringing much cash in and in many ways the QL was the beginning of the end for Sinclair computers. Again there were occasional rumours of a portable computer from Sinclair, powered by batteries and using a form of the flat screen television as a display. Clive Sinclair dismissed liquid crystal displays as being totally unsuitable. At the time there were no reasonably powerful but cheap portable computers and a portable QL, perhaps with battery-backed RAM to avoid the need for a disk drive, could well have been a winner. Although Sinclair looked into the possibility of a portable, no such machine ever appeared, quite likely because it was proving impossible to scale up the flat TV display to a suitable size to make computer text readable. 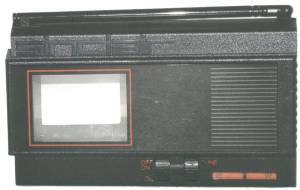 The Sinclair Microvision flat-screen TV, launched in September 1983 at £79.95. It had a 2 inch black and white cathode-ray tube display which was viewed through a Fresnel lens to make it appear the correct height. The Microvision worked well but had a short battery life. By 1986 the first pocket TVs with liquid crystal displays became available, offering much longer battery life and a larger picture. This meant the end of cathode ray tube technology for miniature televisions. The Spectrum +. Notice how packed the keyboard labels are. Late in 1984 advertisements appeared for the Spectrum +, unusually not preceded by any press launch. The 'plus' model was just the old 48K Spectrum in a larger case with the same type of keys as used on the QL and priced at £180. With all the keywords printed on the keys but without the colour coding of the original Spectrum keyboard the result was very cluttered and confusing. The new keyboard and case were also made available to existing Spectrum owners as a DIY upgrade for £20. This pricing structure was very strange since it meant it was possible to buy a standard 48K Spectrum for £130 and upgrade it to a plus model for less than the cost of a Spectrum + from Sinclair! With no internal improvements to the Spectrum design one cannot help feeling this was just a quick way to bring in some extra revenue without spending much time on development. The Spectrum 128K, very similar to the Spectrum + in appearance. By 1985 the Sinclair business was in financial trouble. The Spectrum was losing ground in the UK and the QL was not the hoped-for success. However in Spain, where the home computer market lagged behind the UK, the Spectrum was still selling well and its Spanish distributor, Investronica, decided to produce an upgrade. This had 128 kilobytes of RAM, a good quality keyboard with separate numeric pad, more stable TV display and the facility to drive a computer monitor. Unfortunately Sinclair had made a deal with the Dixons group which prevented them launching a new computer in Britain until Dixons had sold its stock of the Spectrum +. Thus it was not until February 1986 that a UK version of the Spectrum 128K (without the numeric keypad) went on sale in Britain, at the same price as the plus model. Had the 128K been launched instead of the Spectrum+ in 1984 it would probably have sold well, being a genuine improvement on the original Spectrum. But by 1986 its features were not good enough to tempt many new buyers or to persuade most existing Spectrum owners to upgrade. It just missed the important Christmas market and by the following Christmas the Atari ST and Commodore Amiga were on sale. These were ahead of the Sinclair QL in their capabilities and marked the start of the next level of home computing. Sinclair were now in the position of not having any machine selling particularly well and losses were mounting. On 7th April 1986 Clive Sinclair sold the rights to all Sinclair computer products and the Sinclair brand name to Amstrad, which had recently added home computers to its electronics range, for £5 million. Amstrad immediately repackaged the Spectrum 128K (which still had around a quarter of the declining UK home computer market) into a unit with a conventional keyboard, joystick port and built-in cassette deck, named it the Spectrum +2, and aimed it squarely at the games market. Thanks to the huge number of games already written this ensured the Spectrum +2 continued to sell well for a few more years but the model was not really developed further and Amstrad concentrated on cheap IBM PC compatibles, mainly sold as word processors. 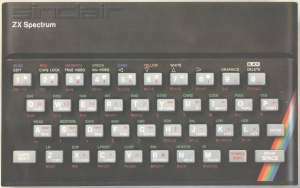 Other options had been available to Sinclair Research which would have allowed them to keep the computer business rather than selling it to Amstrad, but at the cost of Clive Sinclair becoming a minority shareholder. As we saw earlier with Sinclair Radionics, he was not willing to share the running of 'his' business, and rejected these offers. Although no further computers of significance were launched under the Sinclair brand name, Clive Sinclair did sell the Z88 portable in 1987, under the brand name of Cambridge Computer. The Z88 was the fruition of the earlier work on portable ZX Spectrums and QLs, in the form of a battery-powered word processor and address book, and in many ways was the forerunner of the modern PDA. 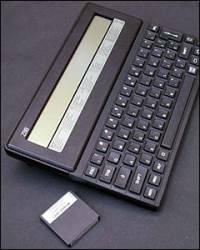 The Z88 had a full size moving keyboard (but of course using a touch membrane underneath) and ironically had a liquid crystal display and a version of Acorn's BBC BASIC. It was well-received by the computing press and sold in modest numbers, but in nowhere near the quantities of the ZX81 or Spectrum. Just after the Amstrad sale, Clive Sinclair announced a joint project with Timex to produce a cellular telephone selling for under £100. This would have been a fully viable product given that in 1986 cell phones usually cost several hundred pounds, but the phone seems to have been slow to arrive (sounds familiar.) It was however on sale in 1991 by a subsidiary, Shaye Communications, set up by Sinclair Research. The most challenging ongoing project, begun in late 1983, was 'wafer scale integration'. The idea was that integrated circuits are normally manufactured by producing tens or hundreds of identical circuits on a silicon wafer, then chopping it up into individual components, which are tested to separate out the large proportion of faulty chips. The working ones are then wired to connecting pins and encapsulated in resin ready for use. 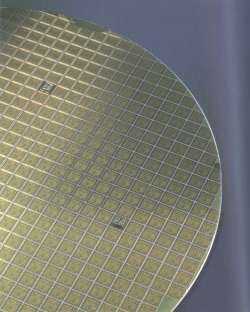 Part of a silicon wafer showing the large number, about 600, of integrated circuits which have to be individually tested and encapsulated. The alternative is to keep the wafer in one piece, including the faulty chips. Built-in test logic and interconnections between the chips would allow the faulty ones to be automatically identified and bypassed, so that only functioning ones were used. Making the testing automatic and not having to package each chip separately would greatly reduce the cost and also allow more compact products. The first planned implementation was to be a low cost 512 kilobyte RAM expansion for the QL computer, and later perhaps complete computers on a single wafer. Wafer scale integration had been recognised as desirable in the 1960s and several semiconductor manufacturers, including Texas Instruments and Burroughs, had spent tens of millions of dollars during the 1970s in unsuccessful attempts to implement it. The main problem seemed to that a huge number of electrical connections to the wafer were needed, but a researcher named Ivor Catt had a different approach whereby all communication with the wafer passed through a single one of the many chips, resulting in a manageable number of connections. With funding from the National Research Development Corporation in the late 1970s Ivor Catt was able to patent his ideas, though they were not converted into a working product. In 1983 Ivor Catt had joined Clive Sinclair's Metalab research department and continued development of his concepts. Ivor Catt is somewhat notorious in the electronics community for his strange ideas on electrical conduction (see The Catt Anomaly) and many journals refuse to publish his papers. However his image as an 'unappreciated genius' probably chimed well with Clive Sinclair's view of himself. Initially it had seemed that the gamble on wafer scale integration would pay off for Sinclair's new company Anamartics and that the QL expansion RAM would be economically viable. Unfortunately the price of conventional memory chips fell rapidly to the point that wafer scale integration no longer offered a clear advantage. The next plan was to use wafer scale integration to develop truly revolutionary computer and communications products, including perhaps 'artificial intelligence' systems. The potential was certainly there but the development costs would be far more than Sinclair Research could fund itself. The trouble was that financial institutions (remembering the C5 and the QL launch) had no confidence in Sinclair's ability to deliver the goods and investment capital could not be raised. Some kind of memory device using wafer scale integration was actually sold commercially in 1989 but Sinclair never made a success of wafer scale technology, nor has anyone else since. As far as home computers (or desktop business computers) were concerned, the Sinclair range, which had seemed unstoppable in 1983, had disappeared from the market by the early 1990s. Sinclair Research still exists (see http://www.sinclair-research.co.uk) and more recently Clive Sinclair has concentrated on electric drives for bicycles and wheelchairs, with moderate commercial viability. See box below. Sinclair's second attempt at an electric vehicle (after the C5) was the Zike in 1992. This was an electrically powered bicycle but whilst more practical than the C5, at £500 it was too expensive and only 2000 were sold. 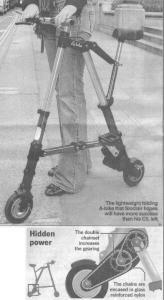 More successful was the ZETA (Zero Emission Transport Accessory), launched in 1994 and costing £145. ZETA was a self contained unit consisting of a rechargeable battery and 174 Watt electric motor, which could be fixed over the back wheel of a standard bicycle. Drive was transmitted to the rear tyre via a belt pressing onto the tyre and controlled by an on/off switch on the handlebars. It was intended to provide assistance to pedalling, for instance when going uphill, and its range on a single charge was 10 to 30 miles, depending on how much it was used, at a maximum powered speed of 14 miles per hour. Approximately 15,000 ZETAs were sold and it was followed by the ZETA II and ZETA III, the latter fitting over the front wheel instead so that a rear carrier or full size mudguard could still be used. Why Were Sinclair Computers so Successful? 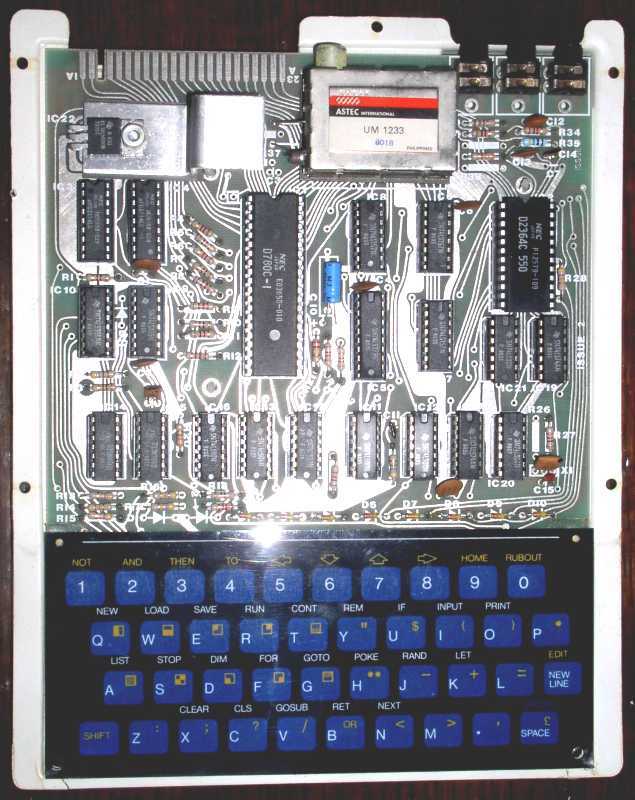 None of the Sinclair computers was particularly innovative in terms of capability but what the designers excelled at was obtaining quite reasonable performance from the minimum of electronic components. This allowed Sinclair to undercut the competition on price and, partly thanks to the fact that most sales were via mail-order, still maintain a good profit margin. Then when sales began to flag the price could be cut even further, giving the range a boost. In Sinclair's heyday of 1980 to 1983 home computers were still seen as expensive toys so a low price was a very definite advantage. Most people had no benchmark against which to gauge their performance so it did not really matter if the Sinclair models were not quite at the leading edge. The most important reason for their success though was Clive Sinclair's promotional skills. At a time when most companies would not consider taking out more than a quarter page advertisement in the electronics hobbyist press, usually of closely spaced text, Sinclair had double page spreads with plenty of white space and always a picture of the product. The picture was very influential in creating the desire for a product, especially when as with the Spectrum it had an eye-catching styling. An order form was always included in the advertisements. There were no High Street computer shops at first and providing a pre-printed order form, with the products and prices clearly laid out, and with a Freepost address for orders, made it that much easier to buy a computer. The importance of making purchases easy did not seem to have been grasped by some other manufacturers. Just consider how many magazine advertisements are vague about pricing, with statements of the form 'from £19.99', or do not mention postage charges, or sometimes do not even have a clear address to send orders to. Sinclair's advertisements were designed to give the impression of a large, well organised, professional, modern business. They also captured the excitement and pioneering spirit of the early days of home computing, without being either patronising or overly technical. The six-side brochure for the ZX Spectrum, which was sent out to previous purchasers of the ZX81 and ZX80. Since the home computer market did not really exist in the UK before the ZX80, it was not so much a case of Sinclair giving the customers what they wanted, as of using the advertisements to persuade people that what they wanted was a ZX computer. The copy was always very fulsome in its praise of whichever machine it was selling; often the claims were a little excessive, resulting in several complaints to the advertising watchdog. Clive Sinclair was promoted by the press, perhaps against his wishes initially, as a British boffin and engineering genius, and became something of a celebrity and hero to young technophiles. In 1983 he was awarded a knighthood. Sinclair even achieved the ultimate accolade of appearing as a puppet on Spitting Image. How many engineers in 2008 are household names? In the 1980s Britain's traditional heavy industries were in decline and the new high-tech industries were seen as the way out of the economic depression. The media coverage given to Clive Sinclair certainly helped to raise the profile of his computer business to the extent that if anyone were asked to name a computer manufacturer they would almost certainly say Sinclair. Finally it has to be said that the Sinclair computers, or at least the ZX81 and ZX Spectrum, were really quite good and could do nearly everything the competition could do, occasionally better and nearly always cheaper. It became fashionable for the computer press and 'experts' in the computer industry to denigrate Sinclair's machines and accuse them of putting users off ever using a 'real' computer. I remember one of my computer science lecturers at university in 1982 saying words to the effect that all desktop computers were mere toys which would never replace remote mainframes connected to teletype machines. The press writers were no doubt accustomed to being given machines to review free of charge and did not properly understand the lure of a low price, and many computer professionals did not foresee that low-cost computers would create completely new fields of use, beyond the established business of accounting and record keeping. Why Did Sinclair Computers Ultimately Disappear? When the British Broadcasting Corporation was planning a television series on the suddenly burgeoning field of computers in 1981, they wanted a desktop computer that could be used on the show and was also available for viewers to buy. One of the aims of the programme was to show the variety of ways computers could be used, covering topics such as programming, graphics, creating music, controlling robots and interfacing to external devices. To do all this the chosen computer would need very flexible hardware and software and plenty of built-in interfaces. For obvious reasons it should also be British. The Grundy Newbrain (whose development had been partly Government-funded) was the original choice but it was behind schedule so the BBC approached the few UK computer manufacturers about making a machine to the BBC's specification. Sinclair was one company approached but the cut-price ZX81 was a long way from what was required, with virtually no way to connect to external hardware, and even the Spectrum, which was at the design stage, was not suitable. No doubt Sinclair could have produced a greatly upgraded model but this would have taken an unknown amount of development work and the time before filming of the programme was due to start was short. 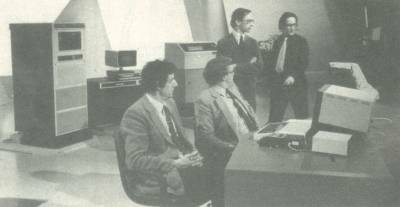 Acorn Computers were another contender and although they did not have a suitable machine on the market, they had almost completed design of a new model, intended to be called the Proton, which would have most of the features required by the BBC. It was a relatively easy task to tweak the Proton design to the BBC's specification and launch it as the official 'BBC Computer'. Hence Acorn got the contract. Although the computer was not sold by the BBC, the fact that it was allowed to carry the name of such a respected organisation was a huge commercial advantage and allowed Acorn to charge a fairly exorbitant price for it. Clive Sinclair bitterly resented having lost out to his arch rival (one of whose co-founders was an ex employee of Clive Sinclair), especially since the BBC's endorsement of the Acorn computer was probably one reason for its success in the education market, to the detriment of Sinclair. Even though the Spectrum went on to sell in larger numbers than Acorn's BBC, the Sinclair models were never perceived by the public as 'serious' computers in the way that Acorn's were. This harmed Sinclair's credibility as a maker of real computers when it tried to move upmarket with the QL. Sinclair's success had been achieved by the ability to cut costs to a minimum, by making do with fewer components and removing anything which was not essential (like a proper keyboard). This approach had worked well when components were expensive but by the mid 1980s the expanding world-wide computer industry meant component prices were falling and there was less advantage in using fewer of them. At the same time the home market was maturing and price was no longer the most important factor in purchases. A home computer just to play games on was being superseded by dedicated games consoles and instead a computer was expected to be suitable for word processing, data storage, creating music, playing advanced games, and to be reliable. Early IBM compatibles running DOS were not really suited to home use and there was certainly scope for an alternative platform. The Sinclair Research approach to product development unfortunately seems to have been to ignore market research and produce the computer they wanted to make. This may have been acceptable when they were creating the market but by the time of the QL the insistence, for example, of spending time getting the Sinclair Microdrives to work rather than fitting off-the-shelf standard floppy disks delayed development and hurt its sales. Finally Clive Sinclair himself seems to have had little interest in computers per se, considering them as just a means to generate revenue to fund more interesting projects like the flat screen television and electric 'car'. Better commitment to the computer business and increased resources for genuinely innovative product development while Sinclair Research was very profitable could have kept the company in business much longer. Sinclair was certainly not the only British computer manufacturer to disappear in the 1980s. Several other companies sprang up after the success of the ZX81 and tried to get into an apparently lucrative business. The home computers they released included the Oric 1, Dragon 32, Enterprise, Memotech MTX, Lynx, and others. Many of these were as good as or better than the Sinclair Spectrum but they all suffered from 'second syndrome'. (Everyone knows that Roger Bannister was the first man to run a mile in under four minutes, but who was the second?) Being launched after the Spectrum was established and had a sizeable range of software available, these others were not sufficiently better to tempt too many buyers away from the market leader. Although the competitors did sell in moderate numbers they faded away even before the Spectrum finally did. So Did Sinclair Computers have a Positive Influence? For literally millions of people a Sinclair ZX81 or ZX Spectrum was their first experience of computing. Although the Sinclair range itself did not last long, it created a demand for the later and better machines such as the Commodore Amiga and Atari ST, and later still as their prices dropped and performance improved, for the descendants of the IBM PC. The final result is that Britain has one of the highest levels of home computer ownership in the world. The industry that it left behind is perhaps not what would have been expected. Britain is a major player in the computer games industry, which world-wide rivals the film industry in size, and which in 2003 produced a balance of trade surplus of almost £200 million for the UK. Without the huge demand for games for the Spectrum would this industry have existed? Unfortunately manufacture of computer hardware in the UK has not been so successful. Certainly there are many companies supplying Windows PCs but these are just assembled from subsystems made in the Far East and loaded with American software. Acorn was the last surviving independent manufacturer but even they succumbed in 1999, although new computers based on Acorn designs are still being made in small numbers. Twenty years ago Britain had the highest level of computer familiarity among the general population of any country in the world but it is hard to see any real economic advantage now from this early lead. Sadly the type of jobs which require such basic familiarity tend to be among the easiest to export to countries with lower wage costs, as we are already seeing with call centres and 'back-office' jobs in finance. Despite the current profitability of the computer games industry in Britain, with the cost of producing a new block-buster game for the next generation of consoles estimated to be £20 million, it may not be long before this sector also moves to countries such as India or China where employment costs are lower. Sinclair was never a large company, only directly employing around 150 staff at its peak, and the British computer industry generally was too small and fragmented to be able to afford the development costs required in the modern PC business, such as setting up silicon chip fabrication plants. Sinclair may largely have created the personal computer market but other countries are now supplying it.